It seems like it was just last weekend that we were sweltering in 80 degree heat, and now it’s dipping into the low 30’s at night. Oh wait, it was last weekend and the temperature shift has been that extreme. I guess that fall is descending upon us with a vengeance this year. My laissez-faire attitude toward my garden this year has turned into a bit of a bust. I didn’t cover my plants the last two nights, so now it will be a rush to pick all the herbs to freeze for winter and dig up the potatoes. (yes, I know I’m late with this, I was late putting them in.) Luckily I did bring in two basil plants I had bought late in the year. These are slated to become tomato sauce for a cold winter meal. The cowl that seemed unnecessary last week is a definite possibility today. I sent the girls to school in fleece jackets and thought about adding hats at the last minute. As for mom, the Hank och stor shawl is a great transistional piece. It’s something that you could tuck under a lightweight coat for an extra layer of warmth, or it would look great in the office. This is for a Cowl of the Month class that I am teaching at Fabric Works in November. I think if I were to make this again, I would join it into a loop instead of a triangle. This would look great long with a shawl pin holding the bottom closed at the top of your sternum. Or, you could make it extra long and double loop it at the neck. It’s a fun knit, and Manos del Uruguay is one of my favorite yarns to knit with. It’s soft and lofty with enough silk to make it feel luxurius. I think there will be another one of these in my future. As for classes, there are more of those in my future as well. I’ll be teaching 3 different classes and a charity knitting night this fall. I’m excited about a little different twist on my knitting endeavors. 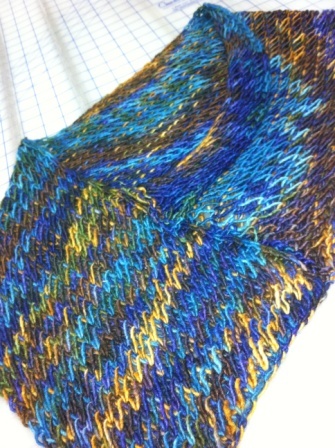 I’ll be showing you the class samples as I knit them up.